Petite Summary: Readers are treated to an entertaining and a hard to-put-down read with an unusual heroine in Stacey Kade's THE RULES. 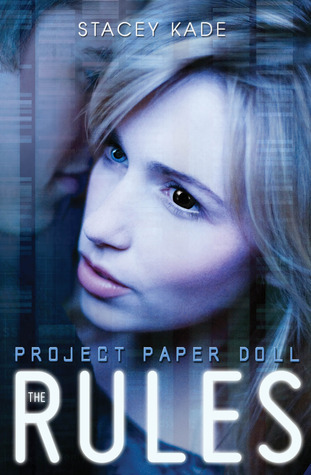 Project Paper Doll reads like a contemporary Young Adult, but with a dash of paranormal (Think Alien/Human Hybrid Teenage Girl) and a nice romance. The great characterization, plot twists and fast pace make this new series a great read. My Summary: Unlike most High School teenagers, sixteen-year old Ariane Tucker is careful not to draw any attention to herself, to blend in with her classmates, to appear average, normal-human. But Ariane is not normal, she's not even completely Human, but a secret hybrid cross between Human and Alien DNA. Ten years ago Ariane escaped from GTX, the genetics lab that created and kept Ariane prisoner. Now with the help of adoptive father, she is in hiding in a small Wisconsin town, where she attends High School not far from the laboratory that created her. But GTX wants her back at any cost and continues to search for her. Trying to follow her adoptive fathers "Rules" for anonymity becomes impossible when Ariane ends up on "Mean Girl" Rachel Jacobs social hit-list. Rachel also just happens to be the granddaughter of the very man who "created" Ariane. When fellow classmate Zane Bradshaw shows a interest in her, and seems to really "see" Ariane for who she is (and not what she is trying to hide), her attraction to him may become both their downfalls. He just might make her "break all the Rules." Suddenly Ariane is confused by all the attention she is getting and all the emotions she is experiencing. And with these emotions rises a new and stronger power she thought lost after her escape from the GTX laboratories, powers that have deadly consequences. Characters: One of my favorite parts of The Rule is the great characterization. I felt that both Ariane and Zane were very likeable characters, and both are feeling trapped by circumstances beyond their control. Ariane feels trapped by all "the Rules" she has to follow because of GTX. Everyday she feels trapped, always trying not to draw attention to herself. Zane feels trapped by his father who makes him feel like he is never good enough, and by his so-called friends, especially Rachel. Together, Ariane and Zane find that something that was missing from their lives in one another. No longer feeling trapped, and no longer needing to follow the Rules. Ariane : "I would do what I wanted. I'd break the Rules and be the Ariane Tucker I wanted to be." Zane : "My dad gave a disappointed huff. And there it was. I winced inside. Back to business as usual. It shouldn't have hurt, not after all these years and so many similar moments, but somehow I just kept getting sucked into hoping. And I hated myself for it." Swoon Worthy Quote: First Kiss from both Zane and Ariane's views. Zane "I leaned over the armrest between us and kissed her, a brush of my mouth over hers. Testing the waters. Her lips were soft, and I felt her catch her breath in surprise." Ariane "A part of my brain was busy pondering the peculiar twist reality had taken that ended with Zane Bradshaw kissing me. And me kissing back." What I liked: I really enjoyed the two alternating points of view of Ariane and Zane in The Rules. You know-there's nothing better than getting inside someones head, especially if that someone is a boy or a part Alien girl. And because of the dual perspectives you could see how Zane and Ariane felt about each other so well. All those crazy boy likes girl, and girl likes boy back feelings. What I would have liked: I would have liked more detail on the world-building, a back-story on Ariane's extraterrestrial heritage. Hopefully in the next Project Paper Doll installment we will get some more juicy Alien details. My Rating: 4 Stars. I really like it.